JC9428. Epidote, quartz, prehnite. Goboboseb Mountains, Brandberg Area, Erongo Region, Namibia. 4 x 7 cm 35g. $14.99 Micro sized epidote crystals with some clear quartz crystals and small blebs of prehnite. JC9404. Epidote, stilbite. Bendougou village, Arrondissement Diakon, Commune Diakon, Cercle de Bafoulabe, Kayes region, Mali. 5 x 7 cm 193g $30.00 The crystals of epidote seem to shimmer in the light, due to a multitude of tiny crystals on the main faces growing in a parallel direction. The luster is quite bright. This one is a little different from the others...it has a slightly frosted look, although the luster is still bright. The color is a bit more of a lighter green than most. Like all of these, it is much better in person so to speak. Very hard for the camera to capture the luster and appearance. Has one 5 cm doubly terminated crystal lying crossways across the middle of the specimen. JC9404. Another view, with the doubly terminated crystal easily visible as the middle crystal termination pointed to the right. JC9410. Epidote. Bendougou village, Arrondissement Diakon, Commune Diakon, Cercle de Bafoulabe, Kayes region, Mali. 7 x 9 cm 282g. $75.00. A beautiful specimen of dark green/dark olive green crystals. 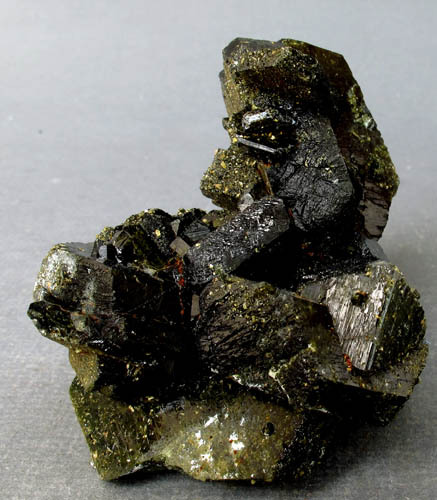 The crystals of epidote seem to shimmer in the light, due to a multitude of tiny crystals on the main faces growing in a parallel direction. The luster is quite bright, what is called the "wet look luster". The main crystal is a fat, double terminated crystal 9.5 cm across (long). Like all of these, it is much better in person so to speak. Very hard for the camera to capture the luster and appearance. The olive color visible in the photo is an exaggeration of the camera...the color is a very dark green as is the main crystal. The little group of crystals growing under the main crystal on the right end in this photo has been sheared off, leaving a flat cleavage plane. There is a gray area on the back side that had the matrix present, and the matrix has come off. There is a minor blemish on the left center, visible as a small olive patch, which is actually a dark green and appears to be where a small crystal grew against the main crystal. JC9410. Another view. The light patch on the main crystal appears to be a contact from where another crystal grew against this one. It is darker in real life than the photo would indicate and blends in rather well. JC9410. View of the back side. JC9415. Epidote. Bendougou village, Arrondissement Diakon, Commune Diakon, Cercle de Bafoulabe, Kayes region, Mali. 9 x 13 cm 497g $75.00. A beautiful specimen of dark green/dark olive green crystals. 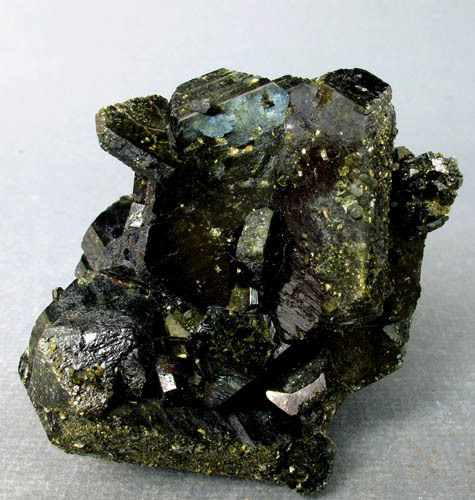 The crystals of epidote seem to shimmer in the light, due to a multitude of tiny crystals on the main faces growing in a parallel direction. The luster is quite bright, almost what is called the "wet look luster". This is a matrix-less group of interlocking crystals. There are several areas where the olive color is more obvious where other crystals used to lie across the existing crystals, I'm guessing that this specimen was in an area where there were a dense amount of epidote and other crystal groups growing up against this group. There are a few broken crystals near the edges of the specimen. There are two small spheres of prehnite on the back side. JC9415. Another view. The olive color is an exaggeration of the camera...it is actually dark green like the main crystals. JC9415. Another view. The olive color is an exaggeration of the camera...it is actually darker green slightly lighter than the main crystals. JC9402. Epidote. Bendougou village, Arrondissement Diakon, Commune Diakon, Cercle de Bafoulabe, Kayes region, Mali. 4 x 7 cm 159 g. $10.00. A few larger crystals growing on the back of the specimen. The front is damaged. Actually a trim piece from one of the other specimens that I thought would look much better by itself instead of attached to another specimen. The back crystal could be trimmed off to make a small miniature. JC9384. Epidote, quartz. Green Monster Mountain, Prince of Wales Island, Alaska. 6 x 7.5 cm 214g. $125.00. Dozens of small terminated crystals with nice luster. A few quartz crystals are scattered around. There are a half dozen or so broken crystals that really don't detract. JC9350. Epidote. Coayllo, Mala district, Canete province, Lima departmet, Peru. 5.5 x 6 cm 210g. $75.00. A group of sharp crystals. Terminations are a little dull...sort of satiny, while the prism faces are bright and lustrous. No damage to the naked eye except for crystals on the very edges of the piece. Crystals are a bit darker than the photo would indicate. JC9351. Epidote. Coayllo, Mala district, Canete province, Lima departmet, Peru. 5 x 12 cm 377g. $75.00 I picked this group as it is different from the majority of pieces I looked at from this find. Terminations are nice and bright on this piece, with shorter crystals overall, good luster. The crystals are sort of fan shaped, expanding and widening towards the terminations, which are multiple terminations rather than the more typical terminations seen in JC9350 and JC9349. Some damage to the left front where a crystal has broken off, visible in this photo. Better in person. JC9352. Epidote. Coayllo, Mala district, Canete province, Lima departmet, Peru. 95 x 11.5 cm 908g. $125.00. Nice vug filled with dark green crystals. Terminations are a bit brighter on this piece, approaching glassy. A few larger crystals are present on the top, approaching the backside, and not visible in the photos. JC9098. Epidote. Djouga diggings, Benduko, Sandari district, Kayes region, Mali. 4.5 x 8 cm 116g. $75.00. There was one dealer from Mali I ran across at Tucson 2017. He had 30 or so specimens from the Djouga diggings, none of which had ever been cleaned...the original red dirt was all over them. I took a chance and bought two, and wish I had bought more, as they cleaned up beautifully. This is a pretty group of epidote crystals, dark green, with bright glassy luster, stacked up nicely in a pleasing arrangement. JC8547. Epidote. Northern Frontier province, North East province, Kenya. A 7 cm tall crystal. 91g. $125.00 These Kenyan Epidotes showed up on the market in 2002, and they almost disappeared as quickly as they arrived. They are superb quality crystals from any locality, but definitely attracted more attention because they came from Kenya. Even though many of the crystals from this find were very good sized, not all of them were the finest quality. This piece is one of the better quality crystals from this find from the standpoint of sharpness and luster. The termination on this one is slightly imperfect. The dark patch on the side is a thin layer of micro crystalline hematite. JC8548. Epidote. Northern Frontier province, North East province, Kenya. A 2.5 cm tall thumbnail crystal with a perfect termination. $35.00. These Kenyan Epidotes showed up on the market in 2002, and they almost disappeared as quickly as they arrived. They are superb quality crystals from any locality, but definitely attracted more attention because they came from Kenya. Even though many of the crystals from this find were very good sized, not all of them were the finest quality. This piece is one of the better quality crystals from this find from the standpoint of sharpness and luster. JC8549. Epidote. Northern Frontier province, North East province, Kenya. 5 cm tall x 5.5 cm wide. 154g. $200.00 These Kenyan Epidotes showed up on the market in 2002, and they almost disappeared as quickly as they arrived. They are superb quality crystals from any locality, but attracted more attention as they came from such an unusual locality as Kenya. Even though many of the crystals from this find were very good sized, not all of them were the finest quality. This piece is one of the better quality crystals from this find from the standpoint of sharpness and luster. This one is a fat, twinned crystal with a rehealed termination on the base, with the twin line quite obvious. JC8549. The bottom termination showing the rehealed crystal faces and an obvious twin line running vertically through the base. JC8553. Epidote. Northern Frontier province, North East province, Kenya. A 4 cm tall parallel group. 53g. $50.00 These Kenyan Epidotes showed up on the market in 2002, and they almost disappeared as quickly as they arrived. They are superb quality crystals from any locality, but attracted more attention as they came from such an unusual locality as Kenya. Even though many of the crystals from this find were very good sized, not all of them were the finest quality. This piece is one of the mid range in quality and still has great luster. JC8554. Epidote. Northern Frontier province, North East province, Kenya. 5 x 6 cm tall. 114g. $250.00. These Kenyan Epidotes showed up on the market in 2002, and they almost disappeared as quickly as they arrived. They are superb quality crystals from any locality, but attracted more attention as they came from such an unusual locality as Kenya. Even though many of the crystals from this find were very good sized, not all of them were the finest quality. This piece is one of the better quality crystals from this find from the standpoint of sharpness and luster. This piece is a nice twin with interesting termination. JC8554. Another view, showing the termination of the twin crystal. JC8554. Back side. the white material is a thin layer of silica (quartz?) that occurs on many of these crystals. JC8555. View showing the two chipped crystals...they are on the lower center and lower left side terminations. JC8555. Another view. The chipped crystal is dead center. JC8556. Epidote, albite. Northern Frontier province, North East province, Kenya. 7 x 7.5 cm 207g $250.00 One of the few matrix specimens. These Kenyan Epidotes showed up on the market in 2002, and they almost disappeared as quickly as they arrived. They are superb quality crystals from any locality, but attracted more attention as they came from such an unusual locality as Kenya. Even though many of the crystals from this find were very good sized, not all of them were the finest quality. This piece is one of the better quality crystals from this find from the standpoint of sharpness and luster. Several views are shown as I try to show how the specimen looks from all angles. There is a small (2mm) chip out of the backside main crystal. JC8556. Close up of the main crystal. JC8556. Another view. I over exposed the albite in order to show the epidote crystal more clearly. JC8556. Another view, this one shows the back side of the specimen. There is minor micro-crystalline hematite partially coating some of the crystals. JC8545. Epidote. Northern Frontier province, North East province, Kenya. 5.5 cm tall 47g. $100.00 A single crystal with minor hematite crystals. These made quite a splash several years ago, when they 1st appeared. A one time find, no more have been forthcoming. Outstanding crystals, with bright luster and deep green color with lighter highlights in bright light. JC7761. Epidote, quartz. Rosario Mabel claim (Flor de Peru II claim), Pampa Blanca, Castrovirreyna district, Castrovirreyna province, Huancavelica department, Peru. 4 x 8.5 cm 45g. $100.00 Flat plate of quartz crystals with epidote sprays on one end. Not many specimens from this find of over 10 years ago were matrix specimens. 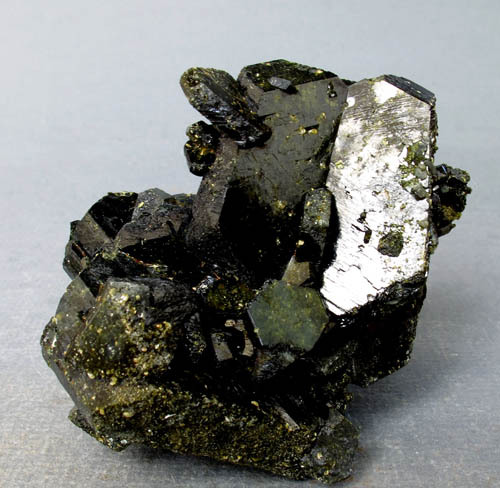 Most specimens consisted of individual sprays of epidote separated from the matrix. This specimen has several epidote sprays on the right end and small crystals scattered throughout. JC7761. Slightly different view. There is one spray that is broken off, it is in the right center and looks like a flat spot. JC7761. Close up view. I brightened up this shot to show the epidote better, although it tends to over expose the quartz. JC7696. Epidote. Raywoo Mine, Quetta, Balochistan (Baluchistan), Pakistan. 5 x 5 cm 103g. $40.00. 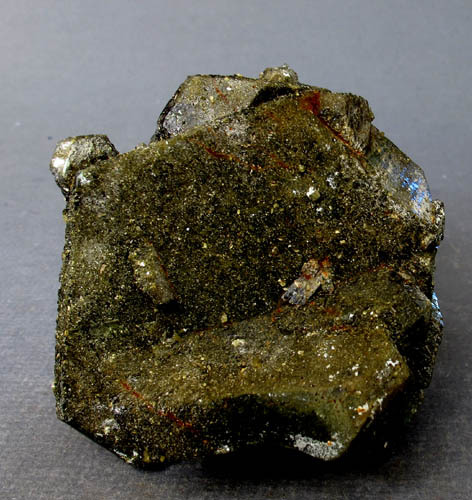 The label says titanite is present, as micro crystals. From the find of a few years ago. ON SALE, TAKE 20% OFF THE MARKED PRICE. JC7589. Epidote, prehnite. Djouga diggings, Benduko, Sandari district, Kayes region, Mali; (also listed as Arrondissement Diako, Bafoulabe Circle). 4.5 x 5.5 cm 142g. $100.00. A nice group of epidote with two lime green balls of prehnite perched on them. No obvious damage. ON SALE, TAKE 20% OFF THE MARKED PRICE. JC7590. Epidote. Djouga diggings, Benduko, Sandari district, Kayes region, Mali; (also listed as Arrondissement Diako, Bafoulabe Circle). 5 x 5.5 x 7 cm 125g. $125.00. 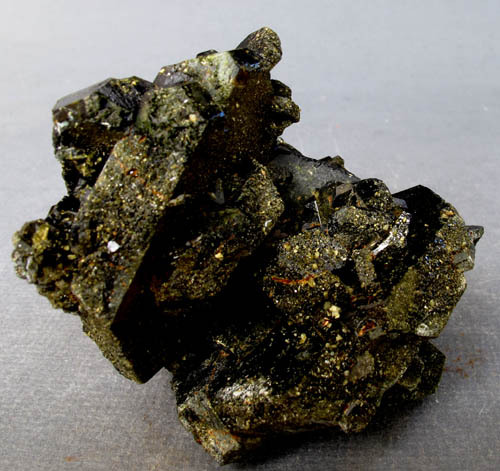 A floater group of epidote crystals with no prehnite. No obvious damage. There is some siliceous chalcedony as a thin white coating on the back side. ON SALE, TAKE 20% OFF THE MARKED PRICE. JC6473. Epidote. Raywoo mine, Quetta, Balochistan, Pakistan. 6 x 8 cm 250g. $200.00. A nicely twinned main crystal with various other odd shaped crystals, some of which are pseudo-hexagonal. Several views are shown of the various sides of this specimen. These came out relatively recently, and are very unusual shaped epidote crystals. There are magnetite inclusions in some of the crystals. I rotated the specimen so that each photo shows a different part of the specimen. The last photo shows what I consider the base...a flat, sort of pseudo hexagonal crystal. I picked this one for the variety of crystal forms as well as the central twin. ON SALE, TAKE 20% OFF THE MARKED PRICE. JC6473. Another view showing the twinned crystals making up the center part of the specimen. A strange triangular shaped crystal is resting on the upper left side. JC8769. Erythrite. Bou Azer, Bou Azer district, Tazenakht, Ouarzazate province, Souss-Massa-Draa region, Morocco. 5 x 5.5 cm 138g. $100.00. A nice doubly terminated crystal in a vug in the center of the specimen. Color is purple. I couldn't get the camera to give the exact color...this is close. JC8769. Another view, with good visibility of the doubly terminated crystal. JC7894. Erythrite. Neust�dtel, Schneeberg District, Erzgebirge, Saxony, Germany. 4 x 6 cm 84g. $60.00 A 2.5 cm patch of crystals on the matrix. A rare old classic. ON SALE, TAKE 20% OFF THE MARKED PRICE. JC7653. Erythrite. Mt. Cobalt, Mt. Isa, Queensland, Australia. 3 x 5 cm 54g. $25.00 Bright crystals on dark schist. A bit better than the average pieces from here.